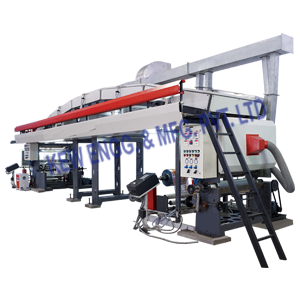 We have been successfully manufacturing, exporting & supplying all types of Lamination Machine since last 25 years from Ahmedabad, Gujarat, India. We are winner of 3 times National Award and 2 times International Award for Quality manufacturing. For Lamination Machine, we have processed all types of material like Polyester, BOPP, LD, PVC, Paper, Film, etc. We have more than 100 installation of Lamination Machine in India and overseas like Saudi Arabia, UAE, Dubai, Sharjah, South Africa, Nigeria, Ghana, Congo, Kenya, Zambia, Sri Lanka, Bangladesh, Malaysia, Pakistan, Nepal, Russia, Thailand, Indonesia, Brazil, Colombia, Venezuela, Argentina, Mexico, Canada, etc. KEW Manufacturer, Exporter & Supplier Of High-Speed Lamination Machine.Paper Lamination Machine, Automatic Lamination Machine, Thermal lamination machine, paper plate lamination machine, industrial laminating machine, komfi laminating machines.